I have had a few requests lately to resurrect my cooking blog. I really appreciate the compliment that that request is! I hope my food blog serves as an inspiration to get cooking. Or if you do cook often, for some new ideas. I know I get stuck in a rut sometimes! Okay, a lot of times. I'd love to hear if you made one of my dishes or even used it as a jumping off spot for another dish. Sometimes just the inspiration is all that is needed. Right now I'm doing a low-carb deal for the month of August. Just to jump start some weightloss. The thing is, I don't think food should be about counting calories or measuring this or that. So I am not counting carbs. I'm being mindful to not go grab a snack of sourdough with butter (oh my god, I want some toasted sour dough right now!) Or not eating a bowl full of pasta. I'm adding in a lot of veggies and even trying some new ones (daikon radish anyone?). If it doesn't look appetizing I don't want to eat it. The other day I came across a green smoothie recipe that the author of the recipe swore tasted like the milk at the end of a bowl of Fruit Loops. Yeah, I know if it sounds too good to be true, it probably is. And actually the thing is, I probably wouldn't even like Fruit Loops these days since I've been eating a real food diet for so many years now. But I was intrigued and against my better judgement I slurried together ingredients like avocado, almond milk and flax seeds. I barely got a few sips down before I thought to myself WHY am I drinking this? It is disgusting. I love avocado in lots of different ways, sweet liquid avocado is not one of them. I love almonds, almond milk, not so much. Flax seeds, well whatever on those. I get my omega 3's through expensive fermented cod-liver oil, I shouldn't need to add them to a green sludge. All this to say, we eat with our eyes first. It's a good instinct to develop. I think that is why I like taking photos of the food I cook. It makes me take a moment to appreciate the work that went into whatever I cooked that is about to be eaten. It is a way to share my art. And when I'm in a cooking mood, it is a creative art. There are times when sure, I just throw some food together for the family.... but other times that I really get into creating a new or favorite dish. So here is the what I made today for lunch. I took inspiration from the flavors of a Chili Relleno. I love spicy soups and I make them for lunch a lot since the rest of the family is just bleh on soup and the girls are a NO to spicy. We eat dinners together but we usually all eat different lunches. 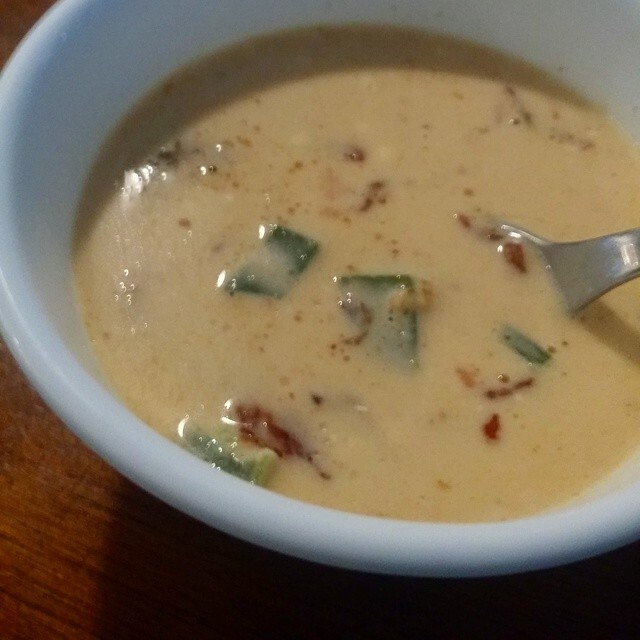 Cut bacon into small pieces and fry in the bottom of a medium soup pot. When crispy remove. Dice and cook onion in the bacon grease, letting it get a bit brown around the edges. Add cut up chili peppers and minced garlic. When the chilis start to get soft, add the heavy cream and cream cheese. Whisk until the cream cheese melts completely. Add salt, pepper, cumin and chili powder. Add chicken stock and bring to a bare simmer. Slowly, slowly add grated cheeses, whisking between each small handful, making sure it completely is incorporated before adding more cheese. Or your soup will separate and it will look gross. Cook at a low bowl for about 10 minutes. Serve adding bacon garnish back in. Serves 2 big bowls or 4 small ones, keeping in mind that with all that cheese and cream it is quite filling soup! Also keep in mind that since there is no thickening agent this is a thin soup.